Forty-seven Catholic elementary schools and seven High Schools form a vibrant network of Catholic schools that serve students in DuPage, Grundy, Kane, Kendall, and Will counties in Northern Illinois. These Catholic institutions offer world-class educational experiences that are firmly rooted in traditional Catholic doctrine to students in pre-kindergarten through grade twelve. 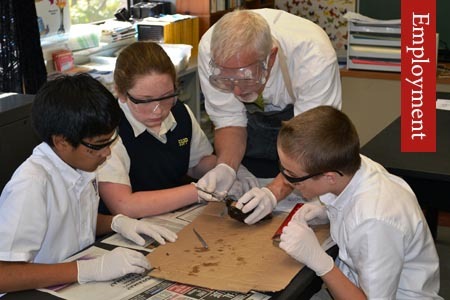 Within these premier schools, students are actively engaged in an integrated and faith-based diocesan curriculum that is both comprehensive and rigorous. At each site, academic excellence is delivered within a nurturing Catholic culture that is firmly rooted in the core values of Catholic education. Our primary goal in the Catholic Schools of the Diocese of Joliet is to form Disciples of Jesus Christ. Challenging academic courses are aligned with state and national standards as well as with the National Catholic Standards. Our teachers incorporate faith into their classrooms and create nurturing learning environments within which high expectations and academic rigor find balance with love and respect. Religion and technology are integrated throughout all content areas, and a variety of before and after-school programs are offered to meet the spiritual, moral, emotional, intellectual, and physical needs of each child. Teachers and administrators hold each other to a higher standard and are expected to exemplify the life of Christ both inside and outside of the classroom. Lastly, we constantly look ahead to ensure that our schools continue to form Disciples of Christ. These core Catholic values unite us, from the office to the farthest corners of the playground. In the labs, on the playing field, in the lunch line and in the classroom. This is who we are and why we exist. The result of what we value is evident every time one visits any one of our school’s classrooms. The joy-filled hearts of students and the love of learning expressed by both teachers and students openly communicate the profound and enduring benefits that only Catholic education brings. Teacher and principal candidates must be devout and practicing Catholics who uphold the teachings of the faith and exemplify an unwavering commitment to Catholic education that is firmly rooted in Gospel values. Most importantly, each candidate is expected to adhere to all principles and tenets of the Catholic faith, to exemplify Christ-like behaviors both inside and outside of school, and to maintain a lifestyle that is in full accord with Church teachings. Additionally, candidates must be willing to accept the challenges of serving as “New Evangelists” within their classrooms and schools. The successful teacher candidate must hold at least a Bachelor’s Degree in an education-related field of study. He or she must also have a current Illinois Professional Educator License (PEL) with endorsements specific to the position for which he or she applies. The successful Principal candidate must possess an advanced degree in educational leadership; hold a current Illinois Professional Educator License with a General Administrative Endorsement; and must have to his or her credit at least five years of successful teaching and/or administrative experience in a Catholic school. He or she also must be willing and able to accept the challenges of serving as the spiritual, and instructional CCO (Chief Cultural Officer) of his or her school. † Transcripts from all universities from which you have earned degrees (BA, MA, E.D., Ph.D., etc.) or through which you have earned graduate or post-graduate hours. Original documents are not necessary. At this point in time, photocopies will suffice if information regarding courses and earned hours is legible. When you are hired, you will be asked to submit official transcripts to the Catholic Schools Office. † Three letters of reference from professionals who can attest to your professionalism, instructional leadership skills, and work ethic. If you do not have a teaching license but hold a Bachelor’s Degree from an accredited institution of higher education in any discipline, you may apply online for a Substitute Teaching License through the Illinois State Board of Education ELIS system. For additional information regarding this process, please contact the Licensure Specialist at your county’s Regional Office of Education. Phone numbers and e-mail addresses of ROEs that are located within the Diocese of Joliet are listed below.